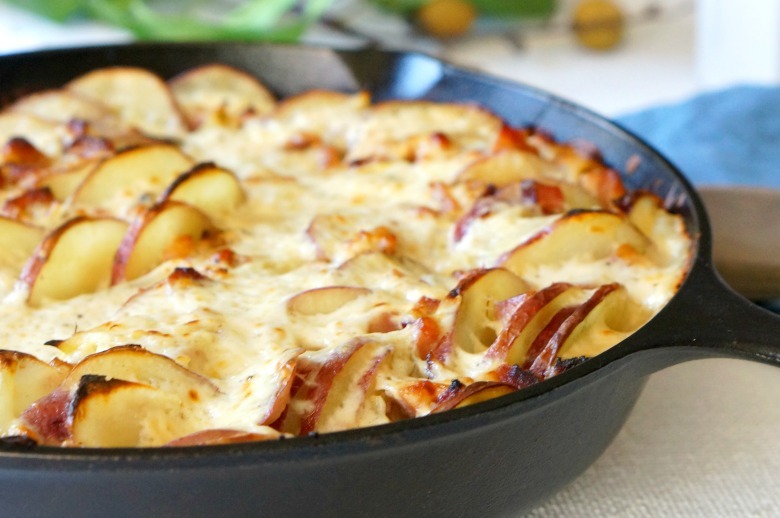 Scalloped potatoes and leftover Easter ham make this leftover ham potatoes au gratin the star of the table. 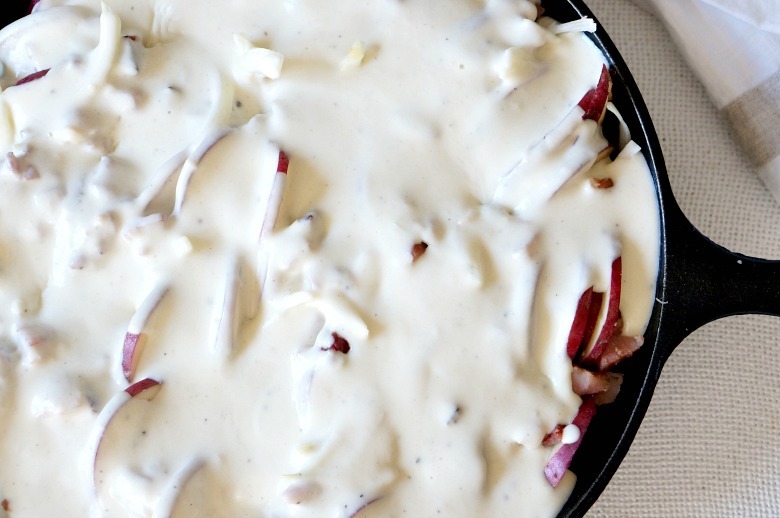 It’s ooeey, gooey cheesy carby goodness, layered with smoky ham flavors. Seriously, even if you don’t have leftover ham after your holiday meal, it’s worth buying just to make this dish. 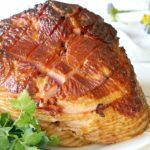 In fact, I’d be so bold as to say, skip the ham and just make this for your guests. It’s a diet buster, for sure, but isn’t that what holidays are for? 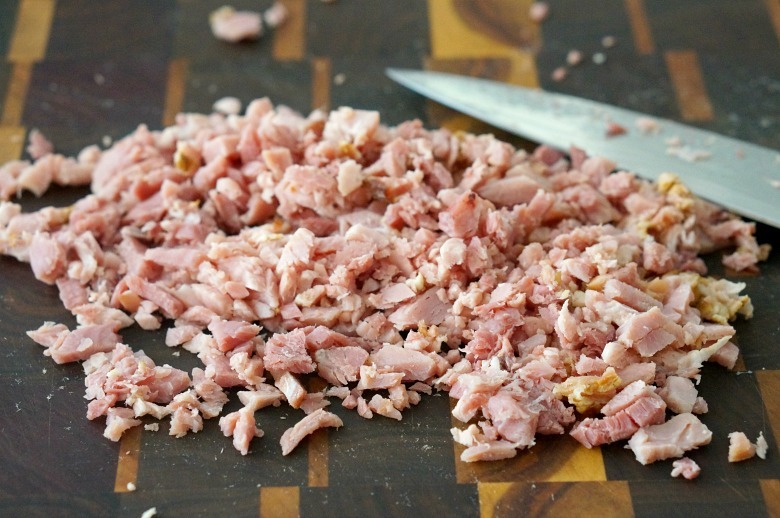 This is one of a few leftover ham recipes I’ll be sharing this week and next. As it happens, I’ve already made two Easter dinners for clients and therefore have plenty o’ leftover ham. 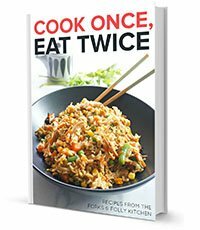 Lucky me, because I’ve come up with some really great recipes. 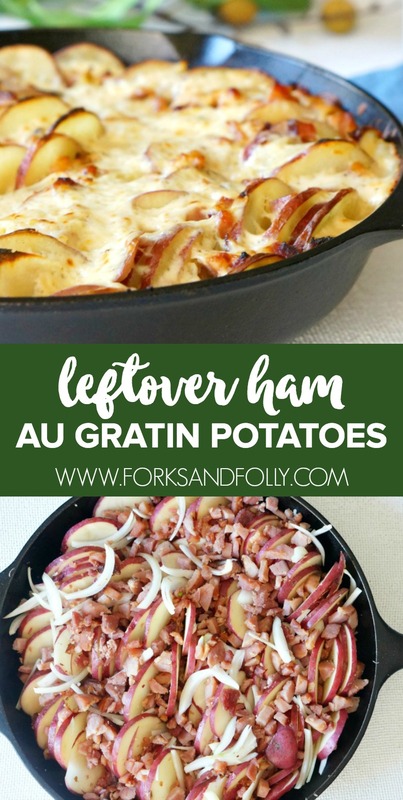 This one for Leftover Ham Potatoes Au Gratin is the best tho’, so if your leftovers are limited. Make this. STAT. Preheat oven to 400 degrees Fahrenheit. In a large skillet, brown the ham over medium high heat until crispy in spots (about five minutes). 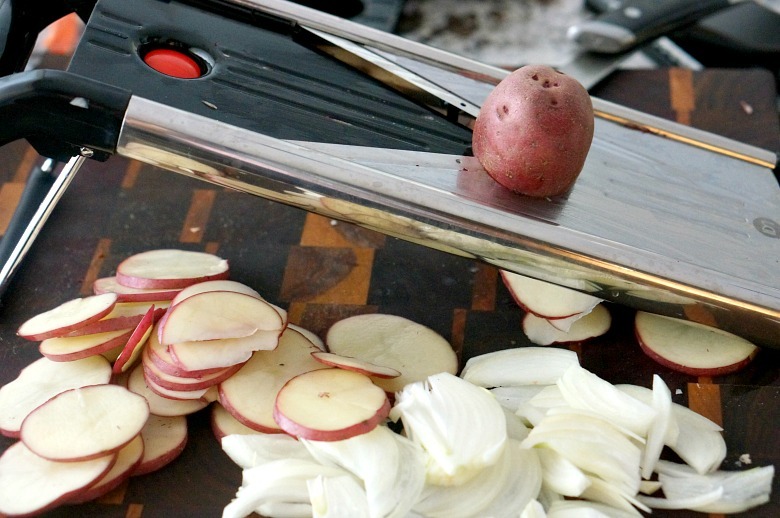 Slice potatoes using a mandoline, if you have one. (But you should totally get a mandoline! It’s fun to play with.) Otherwise, just slice them as thinly as possible. Grease a cast iron skillet. 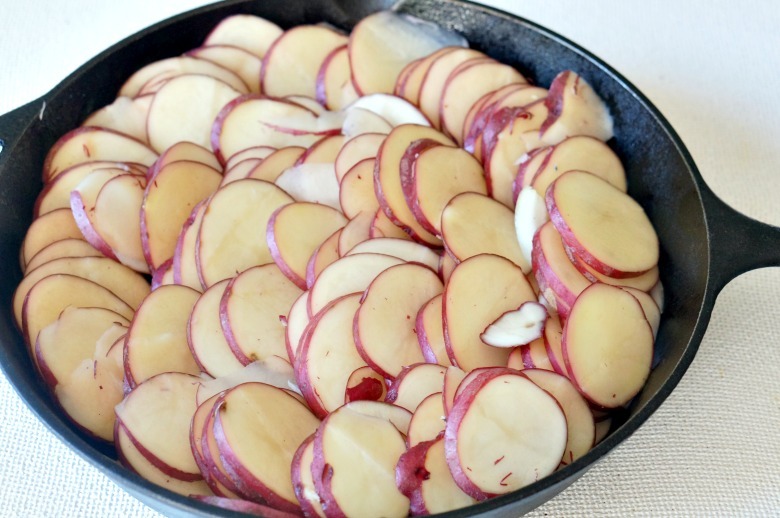 Stack the sliced potatoes in piles, then spread them out into vertical layers in the skillet. Wedge the onions in between, then sprinkle the ham on top, pushing some of it down in between the potato and onion layers. Melt the butter in a sauce pan over medium heat. Add the flour and cook for three minutes, until a light brown foaming paste has formed. Pour the milk in slowly, whisking to incorporate the flour. Add the grated nutmeg, dry mustard, and salt and pepper to taste. 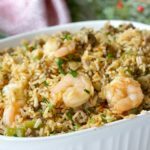 Bring to a simmer and whisk constantly. 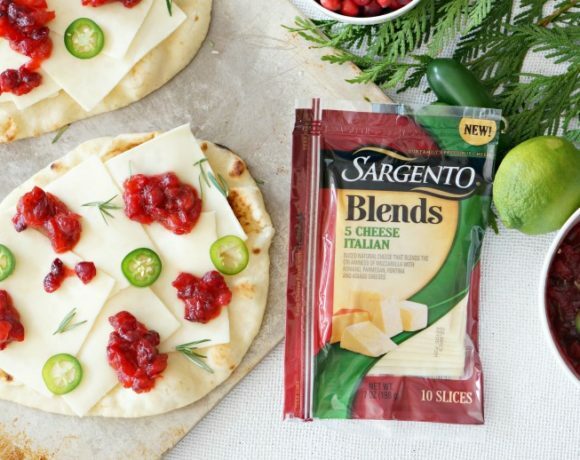 Once thick and smooth, remove from heat and stir in the cheese. Pour the mixture overtop of the potatoes. 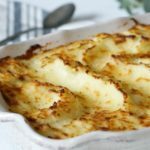 Cover with foil and bake for 60 – 75 minutes, or until the potatoes are fork tender. 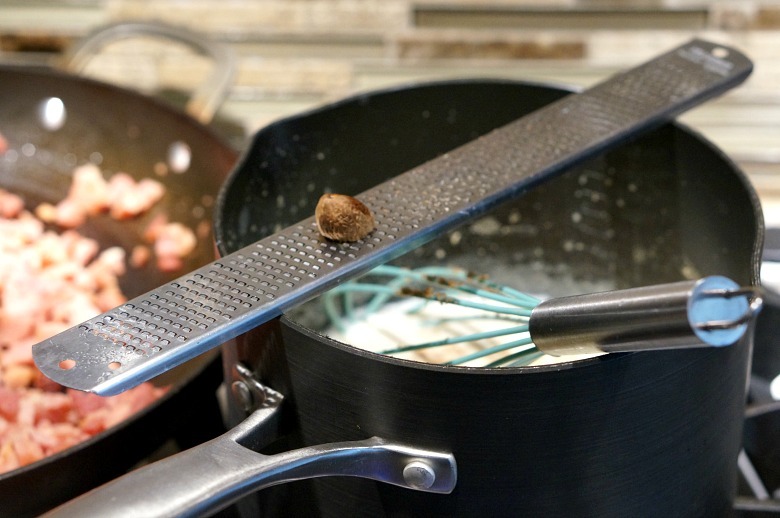 Remove the foil and place under the broiler for five minutes or until golden. 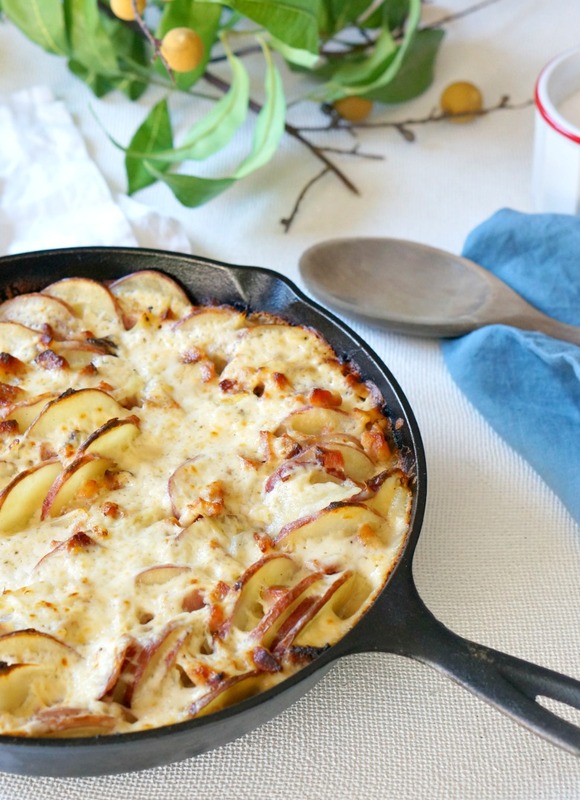 Scalloped potatoes and leftover Easter ham make this Leftover Ham Potatoes Au Gratin the star of the table. 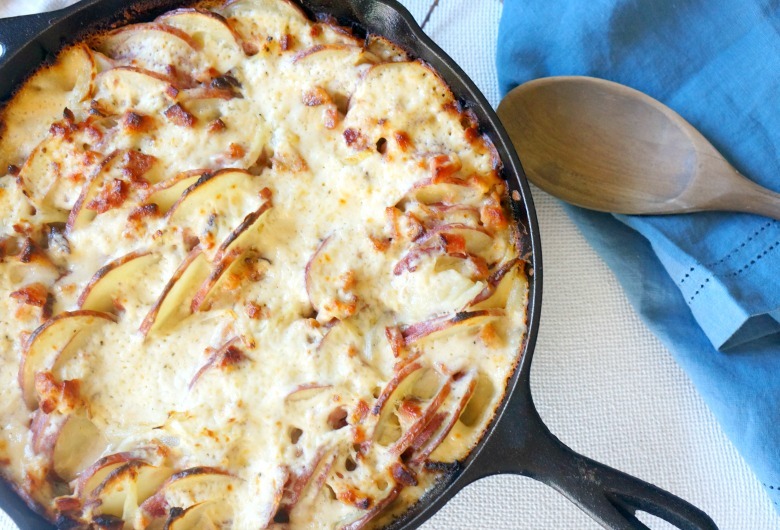 It's ooeey, gooey cheesy carby goodness, layered with smoky ham flavors. Slice potatoes using a mandoline, if you have one. If not, just slice them as thinly as possible. Grease a cast iron skillet. 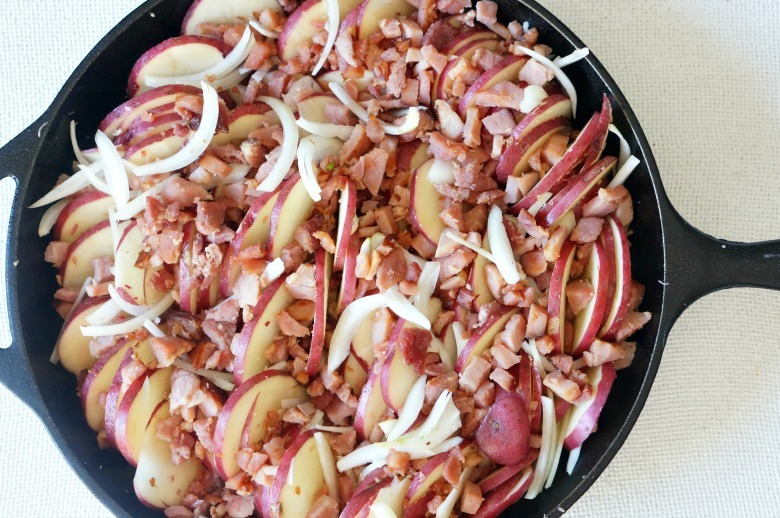 Stack the sliced potatoes in piles, then spread them out into vertical layers in the skillet. Wedge the onions in between, then sprinkle the ham on top, pushing some of it down in between the potato and onion layers. Melt the butter in a sauce pan over medium heat. Add the flour and cook for three minutes, until a light brown foaming paste has formed. Pour the milk in slowly, whisking to incorporate the flour. Add the grated nutmeg, dry mustard, and salt and pepper to taste. Bring to a simmer and whisk constantly. Once thick and smooth, remove from heat and stir in the cheese. Pour the mixture overtop of the potatoes. Cover with foil and bake for 60 - 75 minutes, or until the potatoes are fork tender. Remove the foil and place under the broiler for five minutes or until golden. 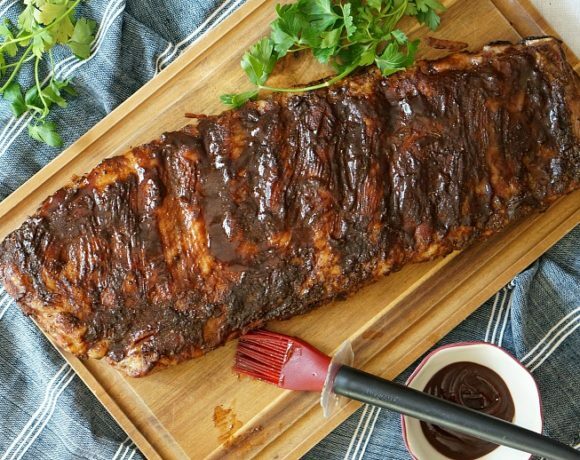 Allow to rest ten minutes prior to serving. 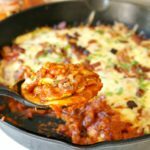 You can also use up leftover ham in these super decadent Croque Madame sammies and in this Garlic Parmesan Pasta Bake with Ham casserole. Oh, and to make a meat-free version of this, check out my recipe for Au Gratin Potatoes that I created on behalf of Harris Teeter last year. 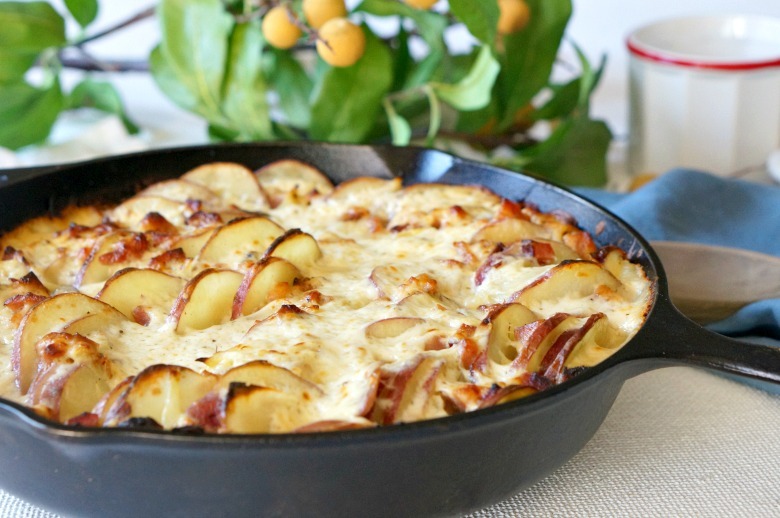 This Leftover Ham Potatoes Au Gratin is an adapted version.